This is a basic biography of Evgeni (aka Zhenya). I will also add competition news here. November 6th, 2006: Evgeni claims in a recent interview that he WILL compete next season! June 15th, 2006: Evgeni became a father! Maria gave birth to their son. Originally, his name was Kristian, but it was changed to Egor. Congratulations to the happy couple! March 14, 2006: Evgeni has decided not to take part in the World Championships, and intends to get some rest while he's busy toouring and such. Best wishes to him! There is no definite answer whether or not he will stay eligible or turn pro. February 22nd, 2006: A late addition, Evgeni is now the Olympic Champion, becoming the fourth straight Russian to win this title. Congratulations. See my competition review of his free skate for my true feelings on this. He also has won his 5th European Title and his 7th National Title. He's becoming a regular Michelle Kwan! Best of luck to him in the future. He plans on staying eligible. "It doesn't matter where it happens. Whether it is in Moscow, Russia, United States or Japan. We are all humans, and it is a sin what those people did. I just want to give my condolences to all the people who were hurt. It doesn't matter who you are or where you are, whether you're American or Russian." Birthplace: Khabarovsk, Russia: a place by the railroad tracks, barely a villiage. Moved to Volgograd when he was three. Hometown: Volgograd until age 11, then moved to St. Petersburg, where he now calls home. 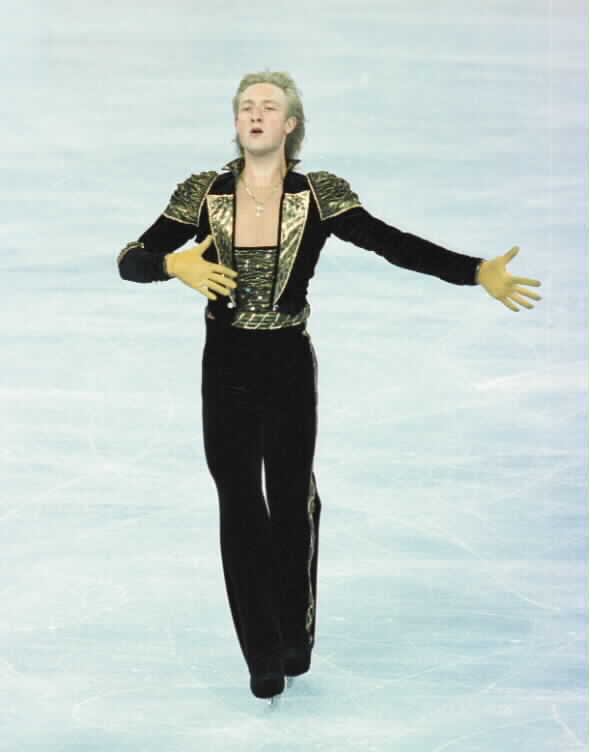 Choreographers: Not sure who is doing his programs this year. Two dancers from the KIROV choreographed his programs from 2002-03. In a few weeks Evgeni will decide whether or not he will compete in the World Championships in Calgary, Alberta, Canada. He does plan to stay eligible, so we'll see what he will do next year. "Without figure skating, I'm nothing." "My goals are simple. I want to win everything! If there's something out there to win, I want it!"